Cipro Poisoning: Have You Been Floxed? : Cool Chef Hats! Do you know anyone going to culinary school? Is Diners, Drive-Ins and Dives one of your favorite television shows? Do you love to cook or bake? Well, if you do, then you should invest in a chef hat or two. 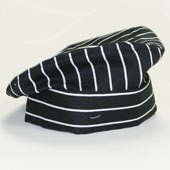 Chef hats are designed and worn to keep hair and sweat from falling into the food that you are preparing. No one knows this better than me! Since I had the chemo for my leukemia last year, my hair is constantly falling out. Fortunately my family loves me and just kind of picks it out of their food and shrugs; true love! As for me, I think that it is disgusting!! So, a search on the internet led me to the coolest website with all kinds of different chef hats. I particularly like the black and white chef hat. I think that I will get it and cover it in Swarovski crystals….hmmmm, that might be a really great idea! are you able to dance or is that a thing of the past with the cancer, chemo, and cipro? The dreaded three C's. That is so sweet of you to ask! And I never thought of it that way: Lucky me, I have the 3 C's!!! Yes, I am able to dance, however, I stopped competing last October.Typically I would have competed at World's in January, which I was really looking forward to, but due to my constant up and down health, I was unable to "really" practice on any consistent basis. If I am lucky and having a really great week, I will be able to dance for a few hours one night a week. It has really been an adjustment, and I haven't really gotten used to all of these "health related" issues yet! I was hoping to compete again this May (2012) but that doesn't seem to be a reality at this point either. Between the side effects from my leukemia meds and the side effects from the Cipro, it has really been challenging. Hopefully soon things will get better and stabilize, some. Cipro Encouraged Me to Have a Garden! Eating Healthy Helped Me Heal!